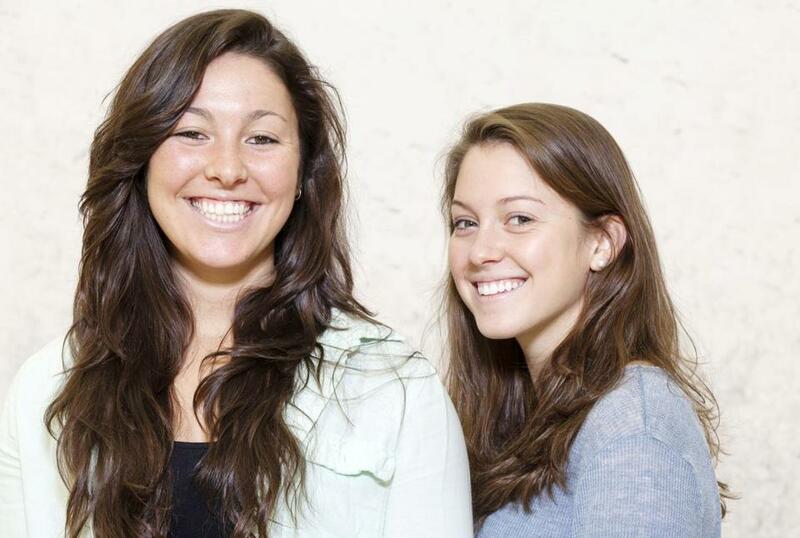 Can Harvard’s Amanda and Sabrina Sobhy bring a sport for One Percenters to the rest of us? Amanda Sobhy, 21, and her 18-year-old-sister, Sabrina, might have what it takes to popularize squash in the United States. JUST AFTER NOON on Martin Luther King Jr. Day, the first American-born squash player to reach the top 10 in the world rankings appeared destined to lose. Already down two games to one in a best-of-five match, 21-year-old Amanda Sobhy again found herself trailing Low Wee Wern, her seventh-ranked Malaysian opponent. Squash games are a race to 11 points, and while individual rallies can sometimes go on for two minutes, Amanda, like many young players, has a tendency to drop points quickly, her emotions overwhelming her honed technique, her form and precision abandoning her. Amanda looked ready to fold. Except she didn’t. The Long Island native, a senior at Harvard, has earned a reputation for not giving up, whatever the score. Bolstered by hundreds of supporters in the home crowd at the Tournament of Champions, which takes place in temporary glass courts erected in Manhattan’s Grand Central Terminal, Amanda started imposing herself with her trademark overpowering style. She crushed the small white ball over and over again, wearing down her slighter opponent. Amanda won the next point and six of the next seven, forcing a fifth game. After falling behind 7-5 in that one, Amanda recovered to win again. She raised both arms in triumph. Members of the audience — a combination of squash fans and curious onlookers passing through Grand Central — gave her a standing ovation, impressed by her tenacity. “Amanda is so dedicated,” says her sister, 18-year-old Sabrina Sobhy, who watched the comeback from the stands. “I picture Amanda with a sled behind her, pulling it along Rocky-style,” says Natalie Grainger, the top-ranked player in the world in 2003, who has watched Amanda play for almost a decade. With the win, Amanda became the first American to reach the quarterfinals of the Tournament of Champions, one of the biggest squash contests in the United States. In the world of international squash — it’s a much bigger sport in places like Egypt than it is here — she has been the first American to accomplish a number of feats. She was at one point the youngest woman anywhere to win four tour titles. She was the first (and is still the only) American to win the World Junior Squash Championships, which she did in 2010 on her 17th birthday. Last September, she broke into the top 10 in the international rankings. One of the remarkable things about being Amanda Sobhy is that she’s not the only one in her family with an impressive squash resume. Come fall, sister Sabrina will be heading to Harvard, too, where she will take over Amanda’s spot on the team ladder. Last year, Sabrina won the US National Championship — a performance that included defeating her big sister in the final. Should they both stick to squash, Amanda and Sabrina will battle on the courts for years to come — and that’s a prospect that could do big things for the sport. In this country, squash is finally beginning to shake off its reputation as a game for the One Percenters and is growing quickly, with the number of players doubling to 1.3 million between 2007 and 2012. More than a decade ago, Venus and Serena Williams brought a new excitement to women’s tennis. Now the charming, down-to-earth, and accomplished Sobhy sisters have a chance to do the same for squash. “If Sabrina took pro seriously, I think in 10 years we could be one and two in the world,” says Amanda Sobhy, at left. 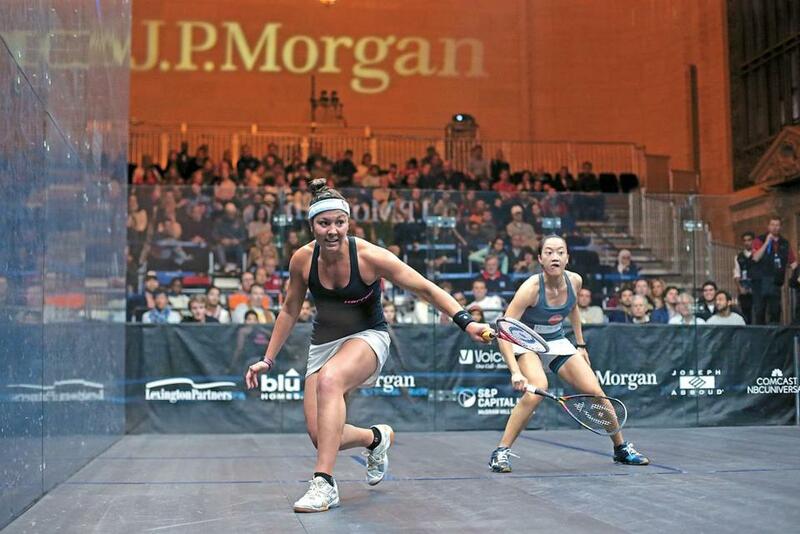 KHALED SOBHY and Jodie Larson didn’t exactly set out to raise the Williams sisters of squash. “It wasn’t like their dad and I had this great vision of building squash players,” says Larson. But the sport did play a central part in the life of their family. The couple, who divorced in 2000, first met on a court on Manhattan’s Upper East Side — Larson once won a lower-level US national championship, Cairo-born Khaled was at one time ranked 35th in the world. Their three kids eventually followed their example. The oldest, Omar, would go on to star on the George Washington University team, winning a national championship in his division in 2011. Amanda started out playing tennis, soccer, volleyball, and softball, but took up squash at 12 after spending countless hours watching her brother train with her father. She progressed quickly under Khaled’s strict program, becoming world junior champion within just five years. Her father remembers that she was nervous the first time she won a pro tournament, worried she’d forget to thank everyone she needed to in her victory speech. Eleven pro tournament wins later, “she’s gotten better,” he says. Sabrina, whom everyone calls “Beans” (although no one seems to remember exactly why), hasn’t found the same level of success as her sister, but she has improved dramatically since Amanda went to college and her father focused his attention on her. Between 2012 and 2014, she rose more than 50 places in the world rankings, topping out at 47th. (In her 2010-11 breakout, Amanda rocketed from 55th to 17th.) Last March, Sabrina had her biggest victory, beating Amanda to win her first US adult title. For a player who is only beginning to step out of her sister’s shadow, it was an important moment. The Sobhy sisters have the same big eyes and easy laugh and the same efficient, compact swing honed by their father’s tutelage, but their on-court similarities end there. While Amanda’s game relies on power — “She’s so strong compared to the other girls,” says Julian Illingworth, a top-ranked men’s player — Sabrina is one of the fastest players on the pro tour. At a Tournament of Champions qualifying match, she appeared to have a preternatural sense for where her opponent, Olivia Fiechter, would hit the ball. Frequently, she moved in the right direction before Fiechter’s racquet finished contact. Amanda thinks Sabrina’s speed is bested only by that of Nicol David. Amanda faces off against Low Wee Wern at the January Tournament of Champions. Amanda consults with her private coach, Thierry Lincou. Amanda frequently trains twice a day — with her Harvard team and with her private coach, Thierry Lincou (a former world Number 1) — so it’s no surprise that she’s savoring a more relaxed senior spring. She’s taking two required courses, but also a few electives that are pass/fail. After graduation, she’ll remain in the Boston area, working with Lincou, seeking out sponsors, and traveling to tournaments around the world. Between prize money, sponsorships, and potential assistance from US Squash, she could make six figures. Sabrina, meanwhile, is enjoying her final semester of high school in Glen Head, New York. She trains with her father once a day, spending 90 minutes on the court and working on fitness for another hour. On a whim, she joined the school play and has her three lines memorized. “It would be pretty pathetic if I hadn’t,” she says with a laugh. Next fall will be different, away from her support group at home and the watchful eye of her father. She admits that the potential for distractions is high in Cambridge, but she’s excited about being part of a team. And the Harvard team, for its part, is happy to have a new star to potentially replace Amanda. 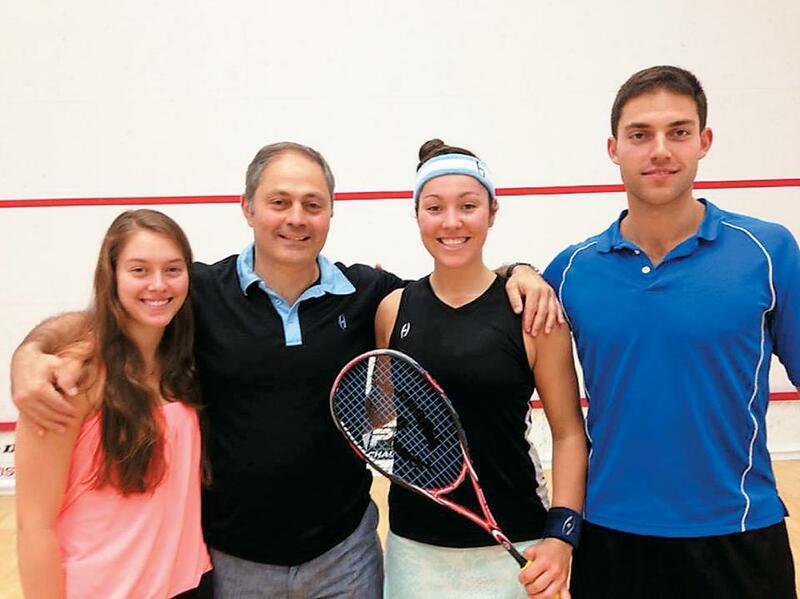 The Sobhy squash dynasty includes Sabrina, father Khaled, Amanda, and brother Omar. The two very different sisters — one a workhorse, the other a natural — are together making an impact on the growing US squash program. In December, they helped the Americans to a fifth-place finish at the world team championships, its best-ever showing. “I think US Squash correctly sees them as a massive asset and will do whatever they can to promote the game through them,” says Grainger. The Sobhys are young, eager, and ready to dominate their sport. Since the top women in squash can play well into their 30s, the pair could be a tour fixture for at least a decade. What does the immediate future hold? Graduation for one sister, matriculation for another. And squash. Lots of squash. - Will the MBTA commuter rail ever run on time? - Green crabs are multiplying. Should we eat the enemy? Noah Davis is a freelance writer in Brooklyn, New York. Send comments to magazine@globe.com. Correction: An earlier version incorrectly referred to sisters Rachael and Natalie Grinham. They are natives of Australia.